With Sarah Palin and Michelle Bachmann being seen by some as serious contenders for the presidency, are Republicans running the risk of damaging the chances of future Republican women seeking America’s highest office? For Switzerland’s News, columnist Patrik Etschmayer writes that the historic, history-related gaffes of both Palin and Bachmann may weigh very heavily on the future of their party – and their gender. Palin’s fans might have an alternative with similar goals who they can throw their sympathies behind – and one who also cannot be dissuaded from making catastrophic historical gaffes: Michelle Bachmann. It was Bachmann who claimed at a New Hampshire fundraiser that the revolutionary battles of Lexington and Concord took place in that state. However, both places are now – as then – located due south, in the neighboring state of Massachusetts, which in New Hampshire is regarded as left-of-center. And it wasn’t a slip of the tongue – because she had specially prepared her speech for that fundraiser and was apparently too lazy to take a moment to look it up on Wikipedia. Even more glaring was her statement in January, when she claimed that the “founding fathers of the United States worked tirelessly until slavery was abolished,” a statement that is simply, utterly wrong. Likewise, various other slip-ups don’t seem to be keeping her from striving higher and aiming for the White House. In any case, her statements suggest that she’ll be the first female contender in the Republican field. 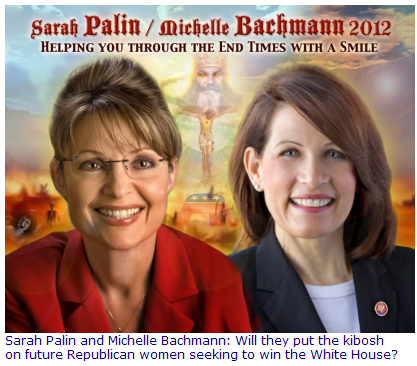 Perhaps all Sarah Palin is waiting for to enter the race is Bachmann, who, among other things, also never tires of interpreting every political development as a sign of the coming apocalypse (which each attempts to support with Biblical verse) – because then Palin will know for sure that she’ll appear triumphantly competent compared to at least one candidate in the Republican field.